Chuck Lewensten ran a successful business, hunted in Africa and played tennis with his fiancé, Jill. Nonalcoholic steatohepatitis changed all that. By the summer of 2010, the disease had ravaged Lewensten’s liver, leaving him homebound and dependent on his family for care. Instead of hunting trips, Lewensten’s travels took him only to the emergency room. “We were watching our dad die,” says Amy Konsewicz, one of Lewensten’s daughters. That’s when Konsewicz’s sister called Mayo Clinic. The call led to appointments with several Mayo Clinic physicians, including Michael Charlton, M.D., a gastroenterologist. That included helping place Lewensten on the liver transplant waiting list. But Dr. Charlton also suggested another option: Living donation. Konsewicz says she and her three siblings were eager to donate, but she knew immediately that she would be the one. Testing proved her right; her blood type and liver size made her a compatible donor. But before surgery could take place, Lewensten needed to be convinced to accept the gift of life from his daughter. At first, he refused. But as his health deteriorated, and after much reflection and many conversations with his family and doctors, Lewensten relented. Surgery took place on Oct. 5, 2010. 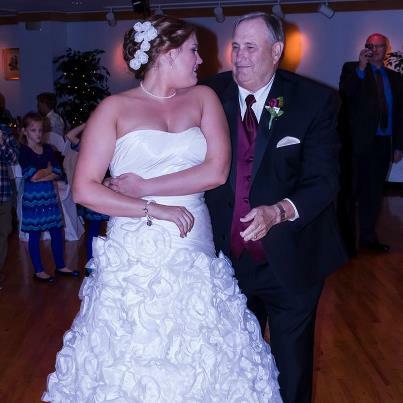 Two years later, Lewensten walked Konsewicz down the aisle on her wedding day. At the reception, Konsewicz and her new husband held a dollar dance that raised close to $1,000 for Mayo Clinic. Konsewicz doesn’t minimize her experience, which included post-surgical complications. But she says she would donate “100 times over again.” Especially if she could donate at Mayo Clinic.